Log in, go to your ad in the control panel, and then click images. There you will find picture upload and under that box you will see picture validation. Validation date will be displayed on your ad. You will get more customers if you are picture valid! Picture validate is for true, real, massage and escorts workers that give professional service to customers. 1. Get a friend or customer to help you take the pictures. 2. Take it yourself with the timer on your camera or phone. 3. Use a big mirror in your bathroom or bedroom to take the picture of yourself - remember to disable the flash. 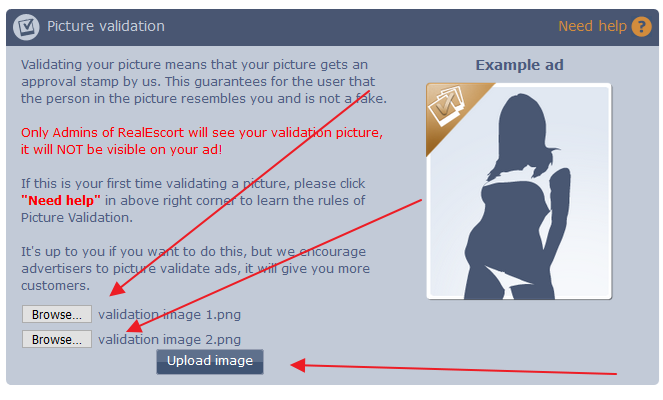 Upload the pictures to RealEscort for validation. BE SURE, on your ad is only pictures of your self! Be sure you look like your ad pictures, if you are much older now, or fatter, or different hair colors or changed considerately from your looks when you had your ad pictures taken, we will REJECT your validation! It's a system where admins/staff of RealEscort get a real picture of the advertiser, where we can be 99% certain it's the person in the picture. Every time an advertiser uploads pictures to their ad we will compare those to the validation picture, to make sure that they are the same! So users/customers on the site can be sure that if they book this person, they will meet the person in the picture, and not someone else! In region, city you are in. In priority ads listed under the regions page. In priority ads on the city page. In lists at the right side. 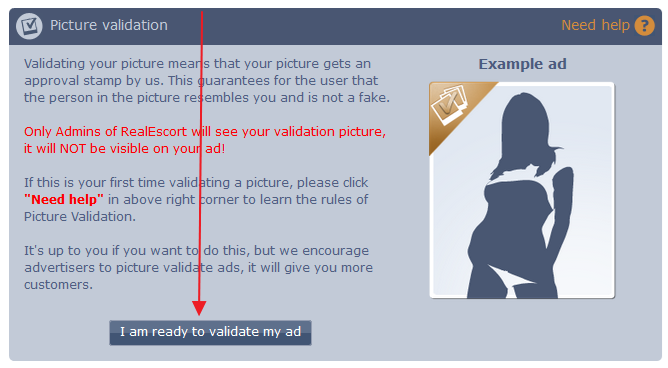 And if they click the picture validation icon they will get information about how we picture validate in a popup just like the one you are looking at now.